Treasure Beach is a world apart ...no all inclusive resorts, crowds or high rise condo's. 6 miles of sandy beaches -coral-coloured and sometimes black sands, private coves and rocky shoreline, in a string of sleepy fishing villages on the more arid, south coast of Jamaica. 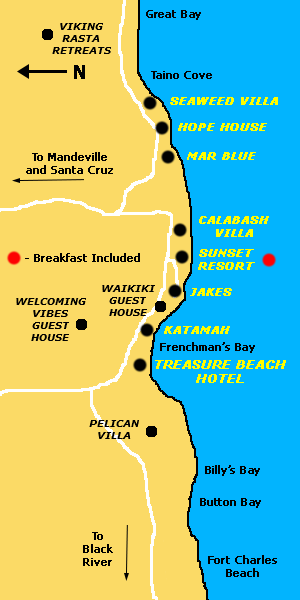 Treasure Beach’s main bays – Billy's Bay, Calabash Bay, Great Bay and Frenchman’s Bay are each unique. Most visitors fly into Montego Bay which is a 2-3 hr ride from the airport to TB. The main activity is just kicking back and taking it easy! There is always a seclude beach, hammock, dominoes game, friendly local ready to chat or spectacular view to help you forget about the fast pace of daily life elsewhere. You can swim ( surf is more active here so heed the locals about sea conditions for swimming), hike , have a massage, take day trips or just chill. A unique day trip only available from TB, is to take a small boat down the coast to visit Floyds's Pelican Bar / a rustic wooden bar built on a sand bank a quarter of a mile out to sea.